Though it's hardly ready overall, we decided to add it to our database now, because no elements of its predecessor are in use any more. Meanwhile, Saturday saw Jagiellonia's first game with two new stands. The rest should follow within a year! 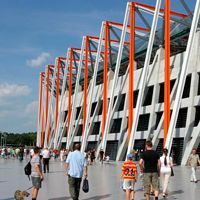 Finally, after many months of delays, setbacks with contractors and cost inflation Białystok received its new stadium. Or 40% of what eventually will be that stadium. But it's the crucial 40% with main grandstand in the west (accommodating the club, corporate clients and players' infrastructure) and fanatic terrace in the south. And already the stadium saw its first sell-out crowd. Of course the first capacity turnout is lower than future numbers, as only 6,100 people were allowed inside on Saturday, when Jagiellonia took Pogoń Szczecin, losing 2:3 after a passionate game. When fully opened, the two stands will hold up to 7,700 people, while within a year the stadium should grow to 22,400. This may be subject to further delays, however, as already the two stands were long overdue. As we cover this project quite often, we leave you now with the very first photos from the new stadium and our updated presentation of what is now the historical Stadion Hetmana.